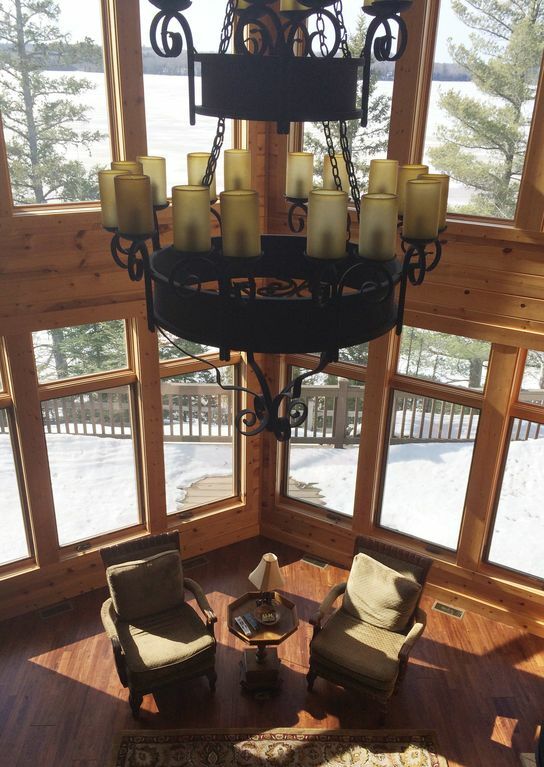 Large luxury hand-built custom home situated on 6 acres on the shores of Lake Michigamme. Large living areas can fit several families comfortably. Sleeps 20! (Small additional fees apply to parties over 16 guests) we also rent the property next door vrbo #1341493 (sleeps 10) perfect for a reunion or for a large gathering!!! Gourmet kitchen, 3 fireplaces, large covered porch, large deck facing water, hot tub, exercise room, sauna, wifi. Main level has beautiful master with lake views and soaking tub. Upstairs has 4 bedrooms with jack and jill baths/showers. The views are breathtaking from these rooms!!! Basement has 2 more bedrooms, 2 baths, a large media room, exercise room, sauna and a 2nd master and a bunk room. The home is all done with custom paint/ stone treatments, wood walls, beams, iron chandeliers and custom decor. It is opulent yet very comfortable and livable. The house lies on an amazing rock bluff overlooking the lake with arguably the best views of the lake! There is road access to the dock area as well as a gradually sloped walking path along the lake for guests of all ages. The dock lies off of a large stone patio with a built in fire-pit (for roasting hot dogs and smores!) as well as a large sand box for little ones who'd like to play. The dock is perfect for swimming (over 15 feet deep at the end) or fishing (we've caught perch, walleye, crappie, bass and pike). Or you are welcome to use our ocean kayaks (untippable) to tour the waters. Take a paddle out to any of the nearby islands for a picnic! Make sure you get back to the house in time for the sunsets- because they are second-to-none! The whole house glows orange nearly every night as the sun sets directly out from the large floor to ceiling windows over looking the lake! They will take your breath away! Perhaps this is why Albert Einstein, Henry Ford and Harvey Firestone used to frequent this lake for their get-aways as well! We also rent property #1341493 next door (sleeps 10) rent Both for larger groups/reunions! We can offer a discounted rate if both are rented consecutively. *A portion of our proceeds goes to help the homeless at home and abroad. Thank you for booking!!! We built this home as a vacation get-away for our family. We have found it hard as our kids get older to enjoy it as much as we would like. We feel like the right thing to do at this point is to share our amazing place with all of you. My wife was raised 30 miles from here and we have always come to back to visit the area. We have lived all around the country and have never seen an area so beautiful and so pure as Michigamme. We chose to build here to give our children the joys of making memories in God's country! This location is remote, yet convenient, which is hard to find in a vacation rental. The air and water is so clean and fresh, soak in the peace and tranquility! You can spend the week at the house and be refreshed or take a day trip or 2 to amazing locations in either direction! There is so much to do and so much to see- you will want to come back for more- we promise!!! There is additionally an outdoor shower at basement level for rinsing off after being at lake. Sauna also has a dbl shower. Extensive west facing lake views (including several islands) from all over the house. Amazing sunsets EVERY night! On a bluff overlooking Lake Michigamme. Road access on property to lake as well as sloped path along lake to dock, paved patio with large fire pit, large sand box and dock. For those who love the snow- There are numerous snowmobile trails (some of the best in the country) accessible from our property. Also there are a number of ski hills and cross-country trials nearby. Great place for cross-country skiing during the winter months. Ski down path and out onto lake to the island for the most amazing serene ski experience! Cabinet covered fridge with built in water/ice dispenser. Another fridge in the basement kitchenette. Flat top electric cooktop in island. Built in fan pops up. Beautiful custom made 60 in table with 6 chairs also bar stools at island. Seats 10 adults...also have a small table and 4 chairs for little ones. Seats 14 total. There is a local boat/jetski rental that delivers to and from dock. Dock is in water June-Sept.
life jackets in front closet...please hang to dry. We have a property manager that can assist you with any needs you may have, boat or jet ski rental or other equipment. We had a large group of snowmobilers so we needed a larger space with lots of beds. This facility exceeded all our expectations. Lots of luxurious space for all our stuff, plenty of parking and close access to the main trail. The owners were very nice to work with and everything was as advertised. This facility does not disappoint in any way. Beautiful home with a lovely view of the lake. The house is wonderful -- spacious, well stocked and very clean. It is quite a ways to any supermarkets so you have to plan ahead for meals and be wary of the 3 miles of dirt road to get to the house, but the house itself is beautiful. Spectacular Home in Picturesque Setting Overlooking Lake. Our family of 13 enjoyed the spaciousness of the floor plan. The sun room. deck, and magnificent great room gave us all plenty of room to relax, chat, and play cards. The kitchen was very well stocked. In the evenings we built bonfires down by the lake. We used the kayaks for little excursions to the islands and around the lake. The hot tub was a big hit ! We actually spent most of the days on the property,with the exception of golfing for the men and teenage boys. We hiked a few times and our favorite area was the hike in Canyon Falls, don't miss it as it was a jewel.We took the kids to the beach down the road in the park. Rebecca was helpful and responded quickly to any questions I had. We were very happy we had rented this treasure of a home in a very rustic,peaceful place. Beautiful property with great amenities. The house is very nice as is the location. We had a hot water issue that was addressed and taken care of very quickly. Great accommodations for our family vacation. Perfect for a multi-family, lots of kids vacation! Last week our family along with three other families stayed at this house for our first multi-family vacation getaway. We had eight adults and eight kids (8 and under) and the house was perfect for our needs! Each family basically had their own wing of the house which meant even after a week together, we were all still great friends. We could accommodate various kid sleep challenges from napping babies to kids that wanted to bunk together. The location was beautiful. Sunsets were stunning. Our families fished, hiked, caught dragonflies, rented a boat, grilled, stayed up late playing games and making music, did crafts, worked out and played with the great toys on-site (legos, hotwheels, dress up clothes, books and more!). The area is rather remote. However, we had a couple fun adventures visiting a copper mine about 1.5 hours away (if you have kids check out the chutes and ladder playground in Houghton) and spending the day in Marquette. We toured a lighthouse, ate pasties and played in the chilly waters of Lake Superior. Van Riper state park just down the road from the house has a wonderful beach and playground. They just opened a new water play area, concession stand and beach chair/umbrella rentals. The homeowners were responsive and helpful throughout our stay. This is a wonderful property, and we would highly recommend it for others wanting to vacation with large groups. Lake Michigamme is one of Michigan's largest inland lakes. It lies 6 miles East to West with a Southern arm extending 4 miles. It covers nearly 4,300 acres and reaches a depth of over 70 feet. It contains over 20 islands throughout the lake which offer beautiful views and amazing fishing locations. The lake contains several types of Bass, Pike, Walleye, Muskie, Lake Trout and even Whitefish. Van Riper State Park lies down the road from the property offering campsites, and beach/boat access if desired. Take the kayaks out from our dock on a morning cruise to the island on a lake of glass. See the ducks and loons as the travel alongside you. Thirty miles East of the property is the beautiful town of Marquette. Lying on the vast shores of Lake Superior (the largest freshwater lake in the world), Marquette all of the 'big-city' amenities with the quaint 'small-town' flair that is so desirable for a vacation get-away. Take a quick trip in for farmer's markets, organic local food co-op, art and food festivals and fabulous dining on the water. Hiking, biking and boating opportunities abound as well. We can set you up for a charter fishing trip to Stannard Rock where we have caught 40 lb plus Lake Trout and have made memories that will last a lifetime! Of course there is a Target, Walmart and other standard shopping that you may need there as well. Visit Greywalls Golf course while in Marquette which GolfWeek named the #2 course you can play in Michigan. Upon it's opening in 2005 it was rated in the top 10 Best New Courses in ALL of the majority golf publications. Breathtaking panoramic views of Lake Superior abound on this course- if you are a golfer, it is a must- see! Marquette Mountain lies right down the road from Greywalls, offering spectacular winter skiing and snowboarding opportunities as well as mountain biking, hiking trails and volleyball in the summer months. If you are a skier there are many other locations within driving distance to enjoy as well as the National Ski Hall of Fame in Ishpeming only 15 miles from the rental. Other fun winter activities include a local luge run, snowshoeing trails, snowmobiling trails, ice fishing and sled dog excursions. The UP 200 sled dog race (Iditarod qualifier) is also annually held in Marquette which is an amazing experience. Take a day trip to the north (@50 miles) to visit the 'Copper Country.' Amazing fall color tours and numerous tours of Copper mines are available as well as tours of Historic Fort Wilkins, a restored frontier army base from 1844, originally built to protector the port during the early years of the copper mining boom. While you are there take the ferry to Isle Royale National Park, a 40 mile long uninhabited island on the US/ Canada border. It is a explorer's paradise with 165 miles of wooded hiking trails. It has a large moose population and is a much loved visit for those who love to 'rough' it. There are a large number of shipwrecks in the waters surrounding it for those who dare to explore them. There truly are too many opportunities to list! If you spend the day at the house fishing, hiking, kayaking, swimming or just reading a book by one of the 3 fireplaces and taking a refreshing sauna you will enjoy every minute. If you care to venture out for the day, either direction on the highway will bring you quickly to areas with amazing experiences on and off the water! We have been visiting this area for over a decade and still haven't experienced all of the sites on our bucket list! Enjoy every minute of this amazing rental!!! 2015 will see a change in rates. Our home is very competitively priced for a luxury home of this size. We have a property manager and family that live in the area that will let you in and out of the house, provide you with keys and answer any questions you may have while you are there. For parties larger than 8 we charge $200 cleaning fee, the security deposit also doubles to $1000. Extra fees apply for more 18 or more guests (see above).There is a 60 day cancellation policy. Thank you!